All Bare Root Plum fruit trees certified virus free, Free UK Mainland Delivery with a FREE FRUIT TREE WARRANTY. Plum Maiden trees are 1 - 1.5 years old when sold, with 3 - 3.5 year old roots grafted on, all other Plum bare root are 2 - 2.5 year old trees with 4 year old roots (arguably a 4 year old tree). The masses of white flowers provide a pleasant fragrance and is a good pollinator for other plum trees. Winter time and the shiny twigs add an extra pleasing aesthetic dimension to your garden. 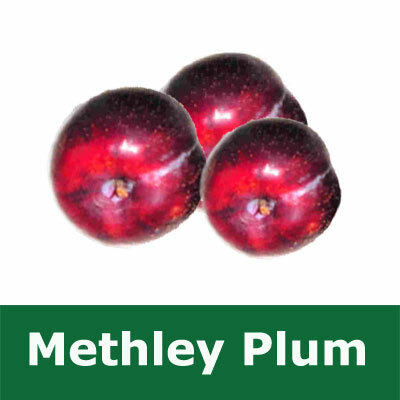 We apologise for the broad supplied height of 1-2m in the Plum bare root product titles. This is because the height of your supplied Plum tree depends on your choice of root stock and the previous growing conditions e.g. weather we have had. As a general rule of thumb the Plum maiden root stock is younger and therefore shorter. The type of root stock you buy dictates the age, shape and several other characteristics of your plum tree. Brompton	: Final height of around 4.0+ metres. Half Standard St Julien A : Final height of around 3.6 metres with the branches starting higher up than the Bush (more conventional tree shape. 2+ years old. Bush St Julien A : Final height of around 3.6 metres but the branches start lower down the tree (easier picking). 2+ years old. Maiden Pixy : Final height of around 3.0 metres. 1+ years old (ideal for Fan/Espalier Training or other shaping) Will provide plums a little earlier than St Julien A rootstock. Bush	: This indicates the shape of the plum tree. A bush will have the branches starting lower down the tree to give a bush shape. All bare root plants need to be planted between November and March whereas our containerised plum trees can be planted all year round. Select the root stock you desire from the drop down menu below or if you are unsure, telephone us on 0800 043 1057 or use the enquiry page. If a plum tree is listed as SELF FERTILE then it produces fruit if planted by itself. If not, then it will belong to 1 of 5 pollination groups (C1,C2,C3,C4 or C5), each group being a 1-2 week block of time in April-May when the plum tree blossoms. When in blossom (or flowers) this is when a non self-fertile plum tree requires a pollination partner from the same group or one up or one down. For example a C3 non self-fertile plum tree requires another C2,C3 or C4 plum nearby. Partially self-fertile plum trees provide fruit by themselves but give more plums if a pollination partner is close by. A typical housing estate is likely to have other plum trees close enough. The Plum bare root season is from November to March/early April depending on weather. If you order outside of these times, your order will be held until bare root trees are back in season. If you order before the season starts, you will get "pick of the bunch" as first come first served and the best trees are sent out first.